The Orlando Eye, a massive Ferris wheel that the operators call an "observation wheel," towers an impressive 400 feet over Orlando with 30 air-conditioned capsules that can each carry up to 15 passengers. If the views were not enough, the capsules will include lighting and audio effects as well as interactive tablets which are all designed to enhance the passenger experience. According to its official website, the wheel uses a stabilized-driven system with a suspended ski-lift capsule design, ensuring a smooth ride aboard the attraction with none of the usual rocking or swinging that comes with normal Ferris wheels. Combine the smooth ride with spectacular views and this sounds like an awesome experience that shouldn't be missed. The Orlando Eye operates seven days a week. Operating hours are Sunday through Thursday, 10:00 a.m. until 10:00 p.m. and Fridays and Saturdays 10:00 a.m. until 12:00 a.m. The admission desks opens at 9:45 a.m. Please arrive 15 minutes prior to your reservation. Check the schedule online for any updates to the time schedule. The attraction is completely accessible. Those using wheelchairs or electric mobility devices are allowed to ride as long as the wheelchair is no wider than 36 inches. Service animals are also permitted. Security must be notified in advance of any oxygen or other medical equipment that will be carried on board the ride. Those with disabilities must book either a wheelchair ticket or a disability ticket. Each paying disabled guest can bring along a caregiver free of charge. The Orlando Eye riders have their choice of different 400-foot in the air experiences. The general ticket can be pre-booked by date and time (when booked at least a day in advance). Tickets start at $25 (as of February 2019). 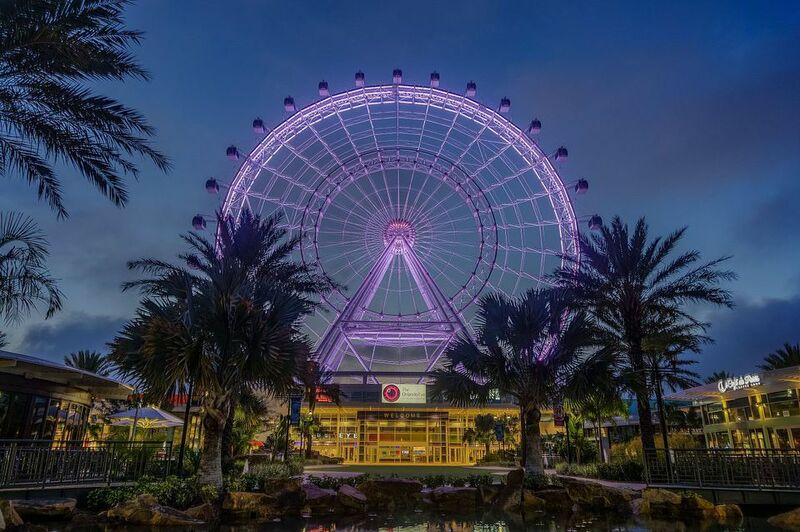 If you're going to be in the Orlando area for more than a day, consider combining a ride on The Orlando Eye with other Merlin Entertainments attractions, including Madame Tussauds, SEA LIFE, and LEGOLAND Florida. Admission to these attractions are good for up to 30 days after your ride on The Orlando Eye and they can save you up to 34 percent over regular ticket prices. Discounts are available for groups that number 15 or more or book The Orlando Eye for special events, which can include private capsules. The Orlando Eye is located in the heart of Orlando's International Drive. From either direction on I-4 take Exit 74A and turn onto Sand Lake Road (right if coming from the west and left if coming from the east). Make a right turn onto International Drive and make a left U-turn after .3 miles and follow signs to the parking garage. Get the most from your vacation dollars by choosing your experience, booking your Orlando Eye experience online in advance and simply show up 15 minutes prior to your reservation. International Drive is notorious for heavy traffic, so allow extra travel time to arrive 15 minutes before your reservation. If you are staying in the International Drive area, use the I-Drive Trolley. Weather may be a factor in the operation of The Orlando Eye. Lightning certainly poses a risk and it may be unsafe to operate during thunderstorms which are a frequent occurrence during summer afternoons. Avoid the 4-D Cinema Experience if you have a sensory condition. This part of the attraction includes flashing lights, wind, sound, water and smells.